Edward Leslie began his career at the side of Terry Bollea in 1977. At the time, the two were billed as brothers. Leslie was Ed Boulder when Bollea wrestled as "Terry Boulder", and Dizzy Hogan when Bollea became "Hulk Hogan". In later years this create confusion among fans, many of whom actually believed that Leslie and Bollea were real life brothers. Leslie briefly wrestled in Bill Watts' Mid-South territory and sporadically (between 1980 and 1982) in the World Wrestling Federation (WWF). In a 2000 shoot interview, he recalled his first match was a tag match with Ron Slinker, against Ox Baker and Eric the Red. Leslie rejoined the WWF as a heel named Brutus Beefcake in late 1984, managed by "Luscious" Johnny Valiant. Beefcake was a vain character, who dressed in outlandish outfits. As a singles wrestler, he feuded with David Sammartino whom he fought to a double DQ at the inaugural Wrestlemania at Madison Square Garden, and WWF Heavyweight Champion Hulk Hogan. Hogan sought revenge on Beefcake after he and Valiant injured Hogan's protégé, Hillbilly Jim (at a show in San Diego in February 1985, Hillbilly had appeared in Hogan's corner for a match between Hogan and Beefcake. While chasing Johnny V around ringside, Jim slipped on a wet spot and legitimately broke his leg). In the summer of 1985, Beefcake began teaming with Greg "The Hammer" Valentine. They became known as The Dream Team. They soon began challenging The US Express (Mike Rotundo and Barry Windham) for the WWF Tag Team Championship. Initially, the US Express successfully met these challenges but, at the August 24 show in the Philadelphia Spectrum, The Dream Team won the title after Beefcake rubbed Valiant’s lit cigar into Windham’s eye. They defended the belts for eight months, primarily from a reformed US Express (Dan Spivey replaced the departed Windham) and The British Bulldogs. At WrestleMania 2, in Rosemont, Illinois, The Dream Team lost the title to The British Bulldogs. They were unsuccessful in rematches for the title and soon dropped to mid-card status. The Dream Team broke up at WrestleMania III. After defeating The Rougeau Brothers at the pay-per-view, the team had an argument and Beefcake was left in the ring while Valentine and Valiant left with Dino Bravo. This (and having had his hair cut by Adrian Adonis in a six-man match shortly before WrestleMania) provided the impetus for Beefcake to turn face. Later that night, Roddy Piper defeated Adonis. Per match stipulations, Adonis would have his head shaved. Beefcake gladly undertook this task, and earned the nickname "The Barber". Thereafter, Beefcake started bringing garden shears (with the handles taped to resemble barber poles) to the ring, and using a sleeper hold as his finishing move. After a match, he would strut around the ring, "snipping" his fingers like scissors to indicate he was about to cut his defeated opponent's hair. As he did (using either his shears or an electric razor) he would throw handfuls of hair into the air for the amusement of his fans. Brutus Beefcake during the 1980s. After coming out on top of a feud with former partner Valentine and ex-manager Valiant (whom, by the end of their feud, Beefcake had shaved completely bald), Beefcake feuded with Intercontinental Champion The Honky Tonk Man. Beefcake vowed to not only win the title, but put Honky to sleep and cut his duck's tail. Beefcake never made good on that vow, since Honky got himself disqualified from most of their matches (wrestling titles generally do not change hands on a disqualification). Honky often had assistance from a mysterious pigtailed and sunglassed blonde named Peggy Sue (WWF Women's Champion Sherri Martel usually played this character during television tapings and PPV events, but at house shows "she" was Jimmy Hart in drag). Beefcake countered with a "woman" of his own: "Georgina" (George "The Animal" Steele in drag). The feud concluded at WrestleMania IV, where Honky was again disqualified, after interference from Jimmy Hart. Though Honky escaped with the title and his hair, Beefcake caught Jimmy Hart after the match and humiliated him with a partial haircut. Beefcake also feuded with "Outlaw" Ron Bass in 1988, beginning when Bass attacked him after a match on Superstars of Wrestling, lacerating his head with a spur. As a result, the injured Beefcake missed his scheduled Intercontinental championship match against The Honky Tonk Man at the first SummerSlam event on August 29. He ultimately defeated Bass in a grudge match. Beefcake then feuded with Randy Savage during 1989. On "The Brother Love Show" (an interview segment on WWF Superstars of Wrestling), Beefcake called Savage's new manager, Sensational Sherri, "Scary Sherri," and an angered Savage attacked him. Eventually, the feud became intertwined with one between Hulk Hogan and Zeus (based around the movie No Holds Barred). Hogan was simultaneously involved in his own feud with Savage over the WWF title. During his match against Savage, Beefcake was assaulted by Zeus. At SummerSlam, Hogan and Beefcake teamed to defeat Savage and Zeus. The rivalry resumed when, on December 27, No Holds Barred was shown as part of a pay-per-view special called "No Holds Barred: The Movie-The Match." In the match portion of the show (taped two weeks earlier in Nashville, Tennessee), Hogan and Beefcake defeated Savage and Zeus in a steel cage match. 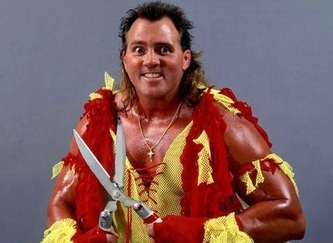 Leslie with Brutus Beefcake's trademark haircutting shears. In 1990, a serious parasailing accident put Leslie out of action. He was helping his parasailer friend prepare for takeoff, when the driver of the boat mistook a cue to take off and pulled the friend's bare feet hard onto Leslie's face, crushing his entire facial skeleton. Over 100 metal plates were used to repair it. To allow time to heal, he put his wrestling career on hold for nearly two years. For a short time in early 1991, a masked character played by Leslie appeared on TV. The character would run in during matches and attack various heels (notably Rick Martel, Dino Bravo and Earthquake). He would run in on their matches, punch them a few times, throw a headbutt and immediately retreat. He never wrestled a match and was never given an official name. Leslie returned as Brutus Beefcake in the summer of 1991, hosting an interview segment called "The Barber Shop." The Rockers split up on The Barber Shop when Shawn Michaels superkicked partner Marty Jannetty and threw him through a plate glass window; this turned Michaels heel and began his singles run to stardom. The final Barber Shop segment took place in February 1992. Newly turned heel Sid Justice attacked Beefcake and destroyed the set, building heat for his feud with Hulk Hogan. In early 1993, Beefcake's facial injury was used in an angle with Money Inc. (Ted DiBiase and Irwin R. Schyster). In what was billed as Beefcake's "comeback match", he defeated DiBiase by disqualification when DiBiase and Schyster double-teamed him. Schyster then tried to reinjure Beefcake, hitting him with a steel briefcase. Longtime heel manager (and manager of Money Inc.) Jimmy Hart turned face by trying to stop his team from hurting Beefcake, and Hulk Hogan returned to the WWF after a one-year hiatus. Hogan and Beefcake teamed for the first time since December 1989, as The Mega-Maniacs, with Hart as their manager. The Mega-Maniacs (with Beefcake wearing a protective facemask) challenged Money Inc. for the Tag Team Championship at WrestleMania IX. and, though gaining some revenge, lost via disqualification. WrestleMania IX was Leslie's final wrestling appearance on WWF television. Following a tour of Europe in July–August 1993 Leslie left the WWF. In 1994, Leslie debuted in World Championship Wrestling. At first, he only made short appearances with Hulk Hogan, who referred to him as Brother Bruti (as he did when they were WWF tag team partners in 1989 and 1993). At that year's Halloween Havoc, following Hogan's cage match victory over Ric Flair, Leslie was revealed as the masked man who had attacked Hogan just before his title match with Flair at Clash of the Champions XXVIII. Leslie subsequently became The Butcher, and formed the 3 Faces of Fear with Kevin Sullivan and Avalanche. The Butcher-Hogan culminated in a WCW World Heavyweight title match at Starrcade, which The Butcher lost. The Butcher continued wrestling for some time after The 3 Faces of Fear broke up in January 1995, then became amnesic, as The Man with No Name. Leslie rejoined Sullivan in his new stable The Dungeon of Doom, as The Zodiac, a character wearing black and white face paint and only ever saying, "Yes, no, yes, no!" The Dungeon of Doom feuded with Hogan for most of the remainder of 1995. Hogan eventually turned Zodiac against his stablemates by revealing him as a mole. 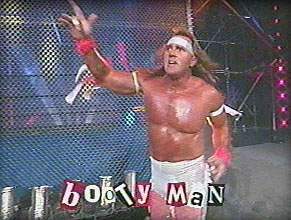 After leaving The Dungeon of Doom, Leslie became The Booty Man, and his gimmick was that of a man infatuated with his own buttocks, shaking them on the way to the ring and during matches. His signature move was a high knee (a homonym of "hiney"). He was accompanied to the ring by Kimberly Page (who became known as The Booty Babe), and feuded with Diamond Dallas Page (at the time, Kimberly's real-life husband). The Booty Man, like Leslie's other WCW gimmicks, did not last long. When the nWo started, he attempted to join and was instead attacked by Scott Hall, Kevin Nash and Hollywood Hogan. Leslie then left WCW for nearly two years. 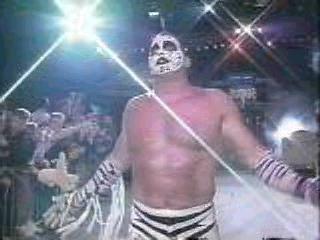 In 1998, Leslie returned as The Disciple, the bodyguard of Hollywood Hogan. He was almost unrecognizable at first, with a new full beard, dark sunglasses, and nWo-styled biker attire. His true identity was later revealed onscreen by Roddy Piper, during his feud with Hogan. The Disciple accompanied Hogan to the ring for his matches, and would often be called on to assist in beating down an opponent, often using his new finishing move, "The Apocalypse". After Hogan became the WCW World Heavyweight Champion in April, these beatdowns often included the title belt itself, which The Disciple would drape over his shoulder before performing The Apocalypse, driving its centerplate into the victim's face on the way down. The Disciple was abducted by The Warrior during Warrior's feud with Hogan, and was later seen hanging from his feet backstage. After being brainwashed by The Warrior, he turned on Hogan and became the second member of Warrior's One Warrior Nation. After Warrior left WCW, The Disciple's push largely diminished and he spent the remainder of his time in WCW as a "jobber to the stars". His last WCW PPV match was the World War 3 battle royal on November 22, 1998. 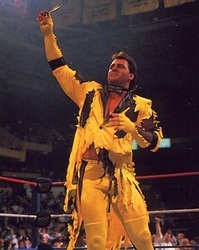 In his final televised match, aired on the November 6, 1999 WCW Worldwide, he wore attire much like he did in his early WWF days as Brutus Beefcake (though still under the Disciple ring name) as he lost to Hacksaw Jim Duggan. Beefcake signing autographs at Comic Con 2013. On January 26, 2008, Leslie was inducted into the XWF Hall of Fame by Jack Blaze. After it became the LPW Hall of Fame, Blaze honored Beefcake again, on March 26, 2010, in Wheeling, West Virginia. 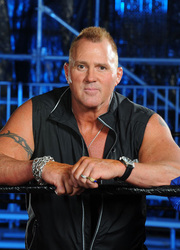 In May 2000, Brutus Beefcake wrestled for the Extreme Wrestling Federation, in a match against Rex Diamond. After retiring, Leslie became part of the Christian wrestling group, World Impact Wrestling. He also started a wrestling school. He made an appearance at Pro Wrestling Syndicate's debut show in Garfield, New Jersey on June 24, 2007. He has appeared at several Memphis wrestling shows, including the 2007 Ultimate Clash of the Legends. Leslie was a coach on Hulk Hogan's Celebrity Championship Wrestling. On July 24, 2009, Leslie competed in "Celebrity Boxing 10" in Philadelphia, losing in the first round to local competitive eater Bill Simmons. He took part in the Hulkamania: Let The Battle Begin tour in late 2009, wrestling across Australia, including Perth and Sydney. On August 28, 2010, Beefcake wrestled for Dynamic Wrestling Alliance, based in Middletown, Ohio.